I Guess Somebody Had to Do it… | Critical End! At first I was just happy to see that they haven’t run out of obvious situations to place The Evil Dead’s Ash in yet. Intrigued, I begin to flip through. 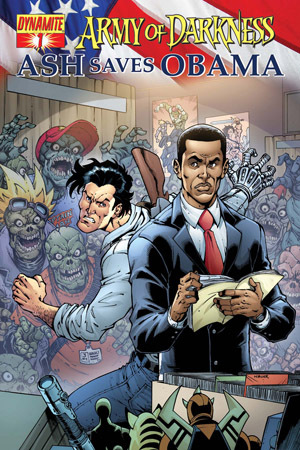 Not to give anything away, but it appears that Ash heads to a comic book convention which is also frequented by Barack Obama (and not some other black guy in a suit as the cover seems to imply). Then the evil dead attacks or something. Typical. Ash and his old college pal President Obama can’t go anywhere these days. Especially during an election season. In the end I decided to pass. I love America. Just not this much. This entry was posted on Thursday, October 28th, 2010 at 6:36 amand is filed under . You can follow any responses to this entry through the RSS 2.0 feed. Both comments and pings are currently closed.